With a record label founded in the very early 1950s, when a book on the world’s first spoken-word label Caedmon Records was first mooted we were very pleased to find both the label founders still active, interested and fully au fait with modern technology, and they have both been generous with sharing their recollections and answering questions. We were impressed to discover that one of the label’s founders, Marianne Mantell, was answering her emails from on board a ship and would be in the UK briefly as part of a cruise voyage this month. She suggested we come over when the boat docked in Liverpool and talk face to face to share her memories of this exciting label. The archive photograph here shows the label founders and two of their recordings stars in 1972. 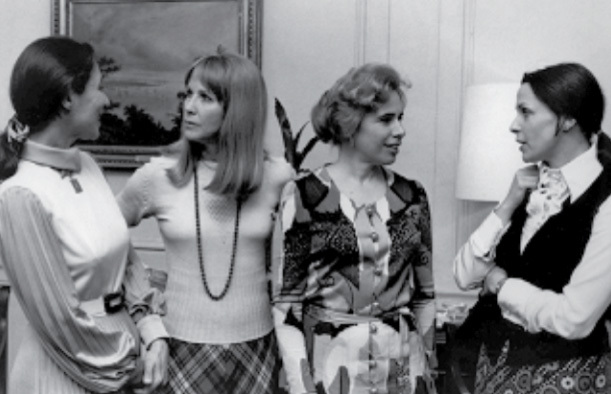 L-R Barbara Holdridge, Julie Harris, Marianne Mantell and Claire Bloom.